The Oscars has been dubbed the “Super Bowl for Women,” although in many ways it is the antithesis—fewer breaks, snacks and alcohol. But this year’s Oscars marked a departure from past shows—and from the big game itself—because for the first time, women took the show, quite literally. 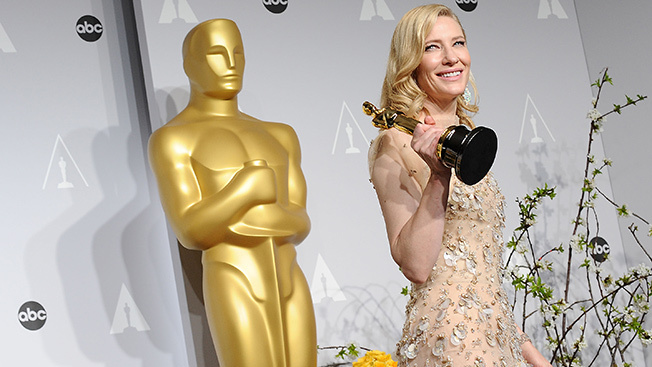 Cate Blanchett, Best Actress winner for her role in Blue Jasmine, said it best in her acceptance speech: not only was this a year of standout female performances, but more importantly, it demonstrated that films with women leads can earn money. Blue Jasmine raked in $14.5 million in five weeks at the box office, and is on its way to being Woody Allen’s highest grossing film ever. Gravity took home a staggering seven Oscars and earned Sandra Bullock a reported $70 million. This year’s Oscars marked a tipping point. There was the usual hype over the fashion, but more symbolically, Hollywood—America’s beacon to the rest of the world—acknowledged women as leads, not just co-stars. As the country prepares to enter an election year with at least one strong female candidate, the entertainment industry is proving that the old-fashioned damsel in distress archetype needs a drastic makeover. It was such a shame then to see advertisers’ input during commercial breaks. The ads stood in stark contrast to the leading ladies on stage. While Blanchett was discussing female leadership, the top advertising spenders delivered ads that were not only behind the times, but completely out of sync with the Oscars’ primary audience—women. JCPenney said that its ad “… celebrates the emotion that comes from finding the perfect fit,” with the line “When it fits, you feel it.” American Express enlisted everyone’s favorite funny girl, Tina Fey, to demonstrate the many uses of its credit card to buy everything from waffles to acne cream to snack food. Meanwhile, Dove delivered an ode to the armpit, real women listing the many abuses incurred by the forget-me-not of body parts. I don’t feel the right to speak on behalf of all women everywhere, but to me it all seemed a bit vapid. Is that all that advertisers think we have going on in our pretty little heads? As David Ogilvy famously said, “The consumer is not a moron, she’s your wife.” Sure, like many women, I’m concerned about whether my sweater fits, my armpits smell and if my credit card will be rejected, but the conversation does not start and end there. At no point did brands embrace the real-life issues playing out on both the big screen and in our everyday lives, like individuals spanning the line between mom and breadwinner, between what’s expected and what’s possible. What was missing was a real insight, not just about who busy moms are, but a deeper cultural tension. Dove could have leveraged the Oscars to extend the message of their incredibly successful Real Beauty campaign celebrating the foibles of real women, but their ode to the armpit lacked the conviction of past work. The Oscars is a prime opportunity for brands to celebrate the bigger cultural moments that Americans are experiencing every day. I would have liked to see brands tap into women in pockets of industries, and across the world, who are breaking conventions, or advocate for those still in need of leadership. One of the eight millennium development goals set forth by the United Nations is to make progress around gender equality and empowerment of women. As many brands push this agenda within their own companies, the Academy Awards could have been their moment to make a statement to a broader audience. If the Oscars are the big game for women, the shortage of insight by the brands that had a presence, and lack of investment by those that didn’t, is quite telling. The advertising industry prides itself on its ability to tap into the cultural climate and lead conversation, but being inclusive of women isn’t enough. At the 2015 Oscars, let’s hope brands recognize that women deserve center stage and acknowledge them as leaders.